100% linen, woven in a twill weave. Fabric weight 250 g/m². Yarn count in the warp Nm 18 (bleached linen), in the woof Nm 20 (natural and dyed linen yarn). Machine washable up to 60 °C but please don't use any optical brighteners or softeners. The towel is pre-washed and will shrink very little. Do not dry in the dryer. A Towel for All Seasons. It is quite large: at one and a half by two metres, it is the multi-function companion for all situations and requirements. 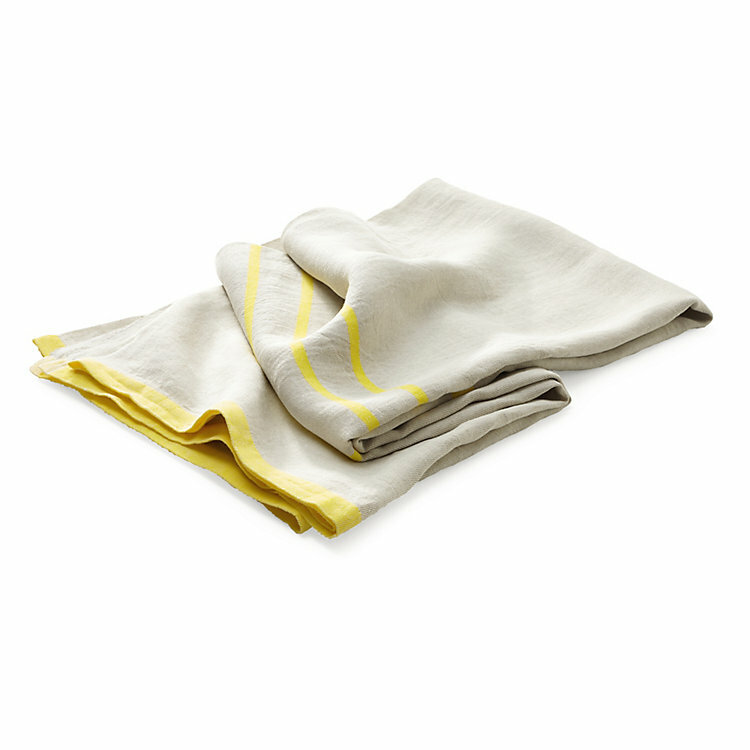 It can serve as a beach towel or picnic blanket; a serviceable hand towel or a blanket to stay warm on the balcony during cool evenings; a bed cover or sofa throw; a table cloth or curtain. The Finish linen weaving mill Lapuan Kankurit weaves the basis from strong, undyed linen and the stripes from dyed linen yarn. At a total weight of approximately 780 g, it is not too heavy for the suitcase while the weave is strong enough to meet all challenges on the road. Linen is above all a comfortable summer fabric since it quickly absorbs moisture and just as quickly gives it off again. It is cool to the touch, is antistatic and because of the smooth surface, is pollen, dust and dirt repellent.